Satisfiability (SAT) and Satisfiability Modulo Theories (SMT) solvers have become the backbone of numerous applications in computer science, such as automated verification, artificial intelligence, program synthesis, security, product configuration, and many more. The summer school covers the foundational and practical aspects of SAT and SMT technologies and their applications. presented by distinguished speakers and experts in these fields. In addition to the theory sessions, we will have practicals in which the participants will work state-of-the-art tools and solvers. For details please have a look at the program. The fourth edition follows the schools that took place at MIT in 2011, at Fondazione Bruno Kessler in Trento, Italy in 2012, and at Aalto University in Espoo, Finland in 2013. The fifth SAT/SMT Summer School 2015 takes place in Stanford, CA. The venue for the SAT/SMT Summer School 2014 is located in the Austrian mountains and conveniently close to Vienna, Austria. The Federated Logic Conference (FLoC) (part of the Vienna Summer of Logic) is scheduled after the summer school. These letters should explain the motivation for attending the Summer School. Based on the application letters approximately 80 participants will be chosen from all qualified applicants. Thanks to our generous sponsors, we will be able to provide financial support (partly covering travel cost and accommodation at the rate for shared rooms) to applicants who are otherwise unable to attend. If you want to apply for financial support, please indicate this in the application form. You need to use our application form to apply. The letters of motivation and support need to be sent to the email address that you will be provided with after sending the application form. 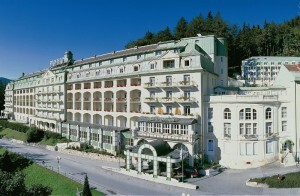 The hotel needs to be booked separately by the participants. Do not book accommodation before you have received notice that you have been accepted. We will provide you with a form for booking the rooms. The fees include the lectures, coffee breaks, the three lunches, dinner on July 10th and the banquet on July 11th. It does not include accommodation and travel expenses; for students with grants, the grant will cover (part of) the cost of accommodation. Participants are kindly asked to bring their own laptops (if possible) for the practical sessions. The participants will be given an opportunity to present a poster of their research. A poster to advertise the summer school is available here. The following events take place in Vienna after the SAT/SMT Summer School 2014. Please consider submitting to and attending these conferences and workshops.